You are a shop owner, you have a powerful website and a chain of offline stores but your customers hardly find your local stores, then you lose a huge of customers. Store Locator Extension for Magento 2 is an effective solution that you must integrate into your site to resolve this problem. 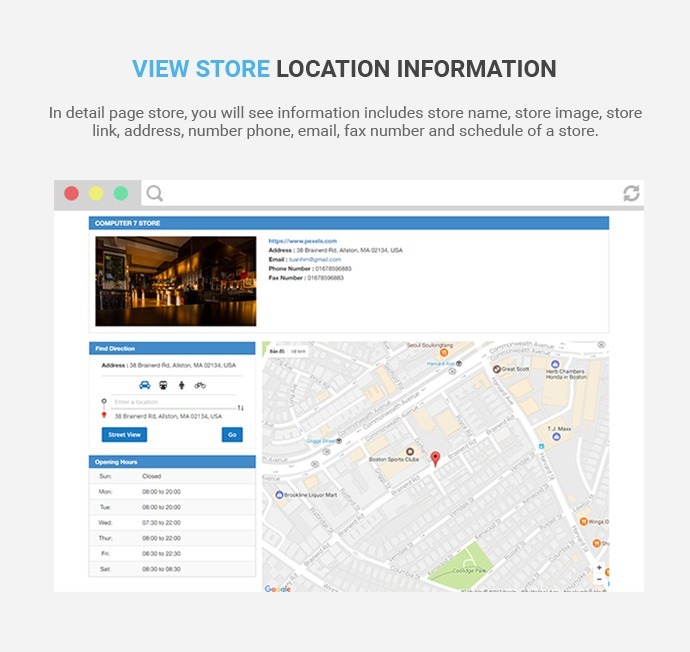 It shows all store locations, show each store's info including images, open/close time, store description... and allow your customer search for closest stores by distance, zip code, state etc. + Create unlimited store locations. + Easily to add/edit/delete store detailed information such as address, images, contact info, etc. + Set store's open times & days off flexible. + View all store list and store location on Google map. + Get instant directions from a location to any store. + Easily determine the nearest store. + Google maps suggestion address. 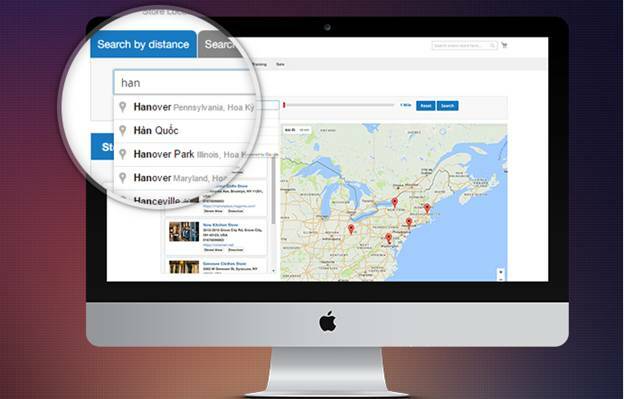 + Search stores by area (a store name, country, city and zip code) and by distance. + Opening hours, days off & working days. + Store contact's information: Address, phone, fax, email, website URL, etc. Step 1: Go to Store Locator Page through the link in header and footer. You will view all store list here. Step 2: Find Store location that is nearest them: You can search store by area ( store name, country, city and zip code ) or by distance ( fill in your location and select distance ). Step 3: Store Location Information: Click on Store Location you want to view detail information's it: location image, store description, store link, email, phone number and fax number. Step 4: Define distance from any location to store location: In this store location in list store, you click on Direction button to determine the distance from your location to store location. Step 1: Install as the description in the user guide. Step 2. Schedules Management: In admin panel, you click on STORE LOCATOR -> Manage Schedules -> click on Add New Schedule or select a schedule to edit. You can add/edit/delete all schedules. Remembering Save after each change. Step 3. 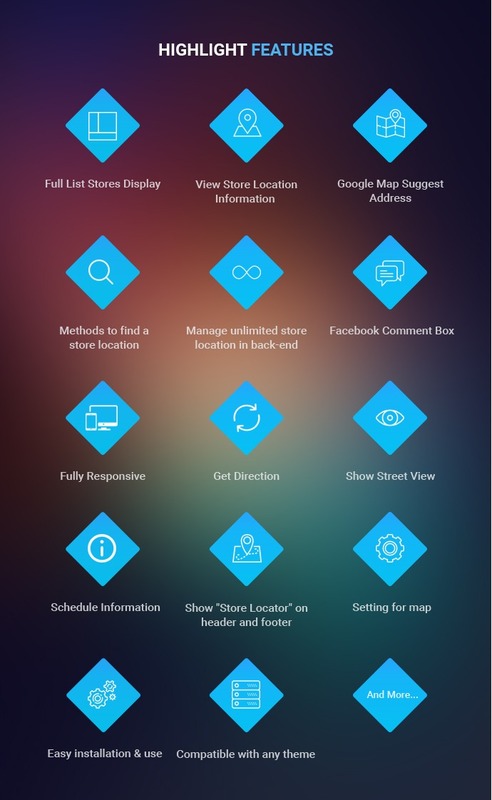 Store Locations Management: In admin panel, you click on STORE LOCATOR -> Manage Store Locations -> click on Add New Location or select a store location to edit. You can add/edit/delete all store location. Remembering Save after each change. Step 4.Configure extension: In admin panel, you click on STORE LOCATOR -> Settings and setting something about this extension here. Remember to save config after each change. Step 5: Go to front-end to view changes. 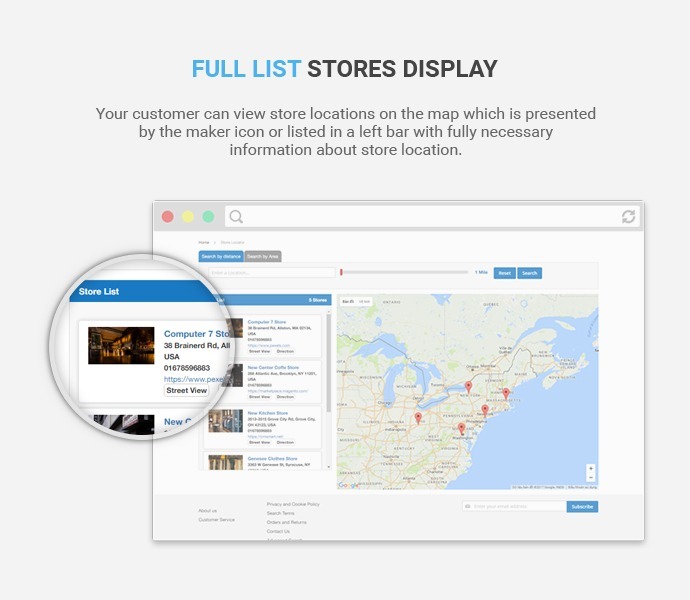 Full List Stores Display: Your customer can view store locations on the map which is presented by the maker icon or listed in a left bar with fully necessary information about store location. View Store Location Information: In detail page store, you will see information includes store name, store image, store link, address, number phone, email, fax number and schedule of a store. 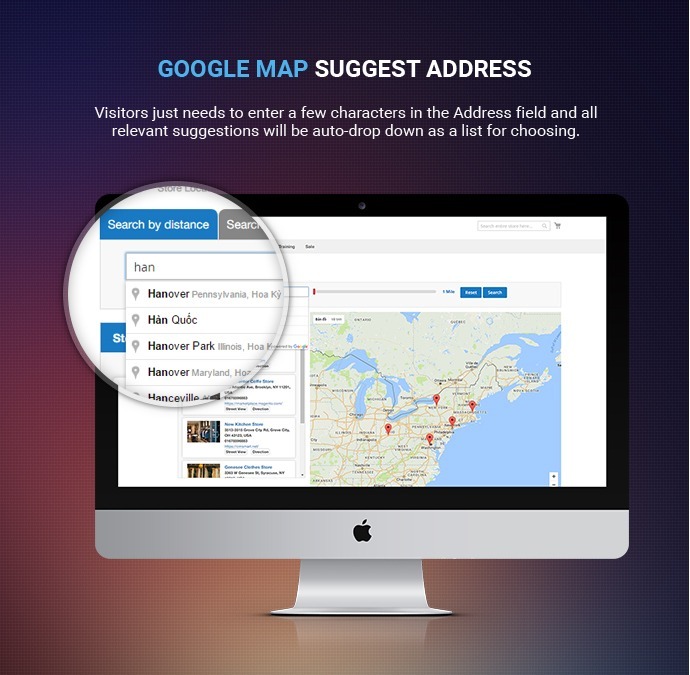 Google Map Suggest Address: Visitors just needs to enter a few characters in the Address field and all relevant suggestions will be auto-drop down as a list for choosing. 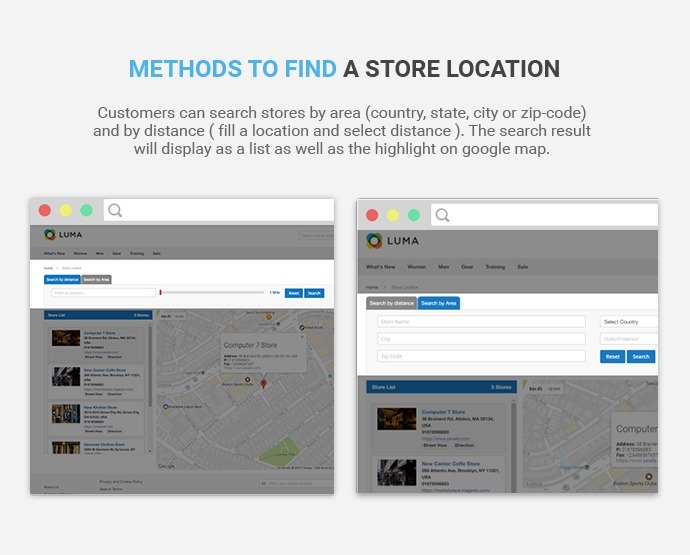 Methods to find a store location: Customers can search stores by area (country, state, city or zip-code) and by distance ( fill a location and select distance ). The search result will display as a list as well as the highlight on google map. 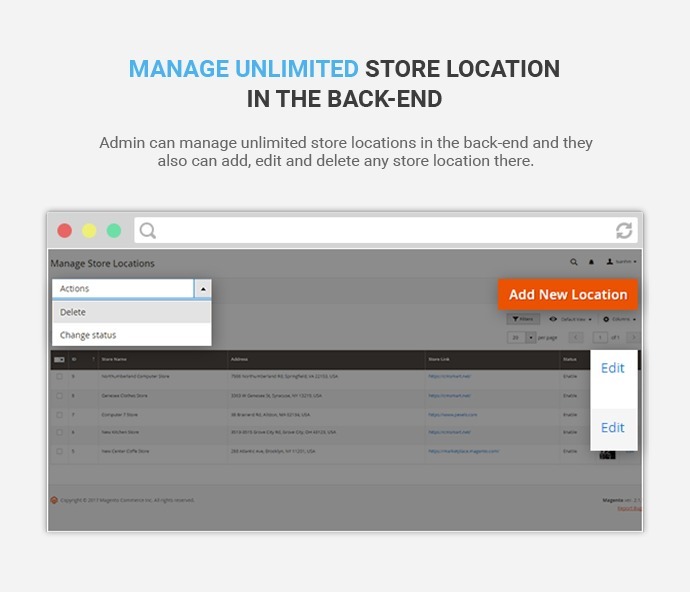 Manage unlimited store location in the back-end: Admin can manage unlimited store locations in the back-end and they also can add, edit and delete any store location there. 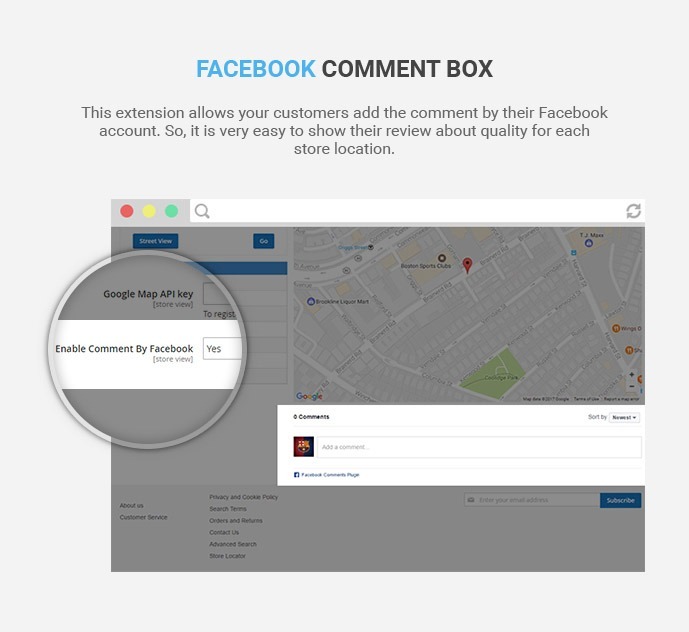 Facebook Comment Box: This extension allows your customers add the comment by their Facebook account. So, it is very easy to show their review about quality for each store location. 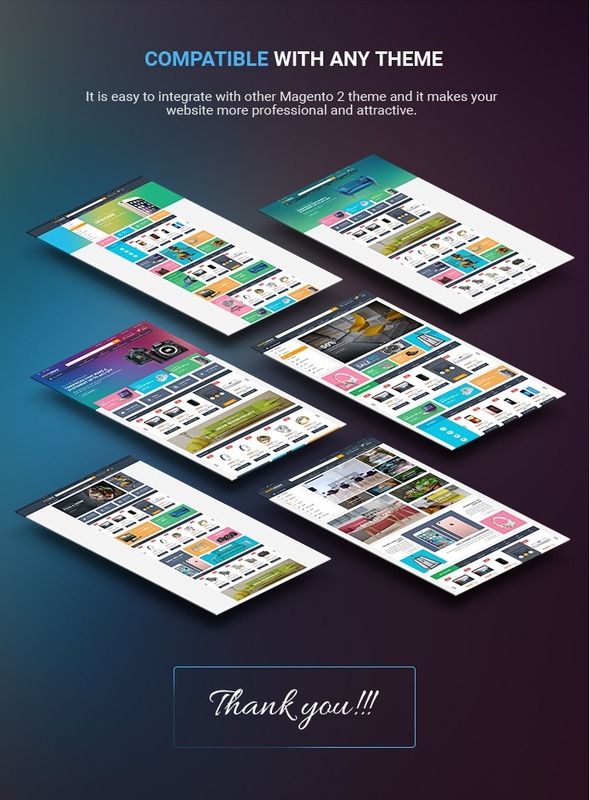 Fully Responsive:. 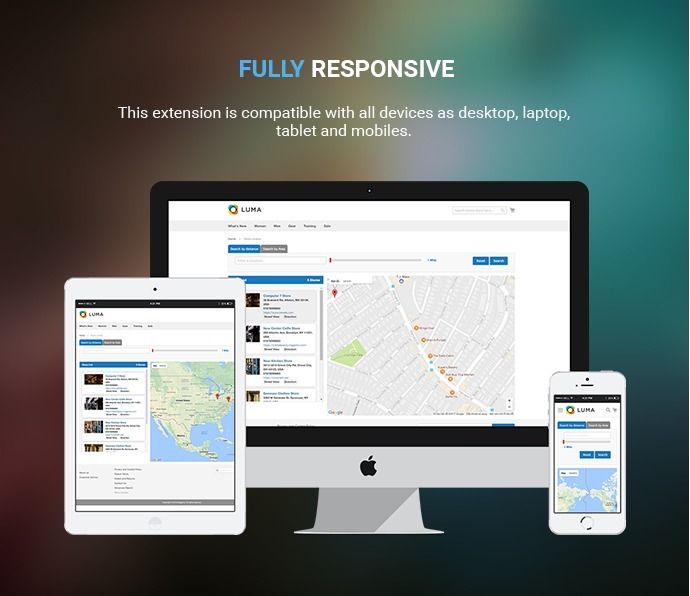 This extension is compatible with all devices as the desktop, laptop, tablet, and mobiles. 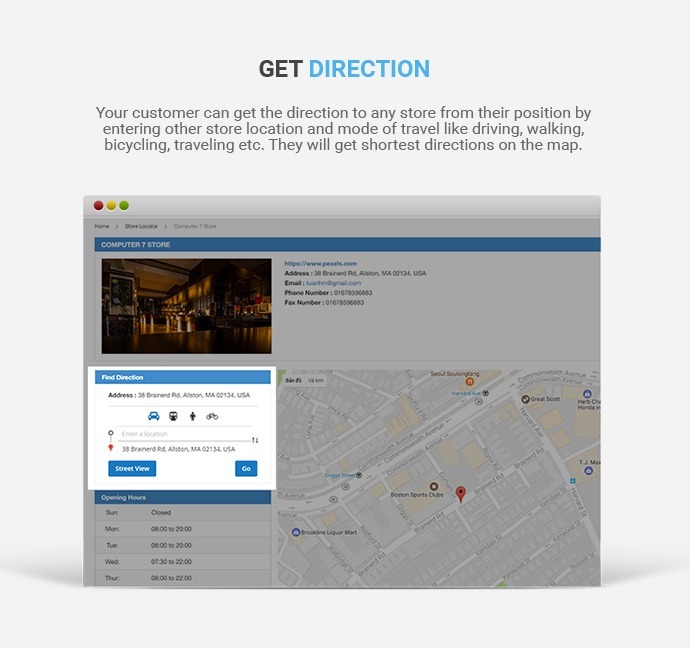 Get Direction: Your customer can get the direction to any store from their position by entering other store location and mode of travel like driving, walking, bicycling, traveling etc. They will get the shortest directions on the map. 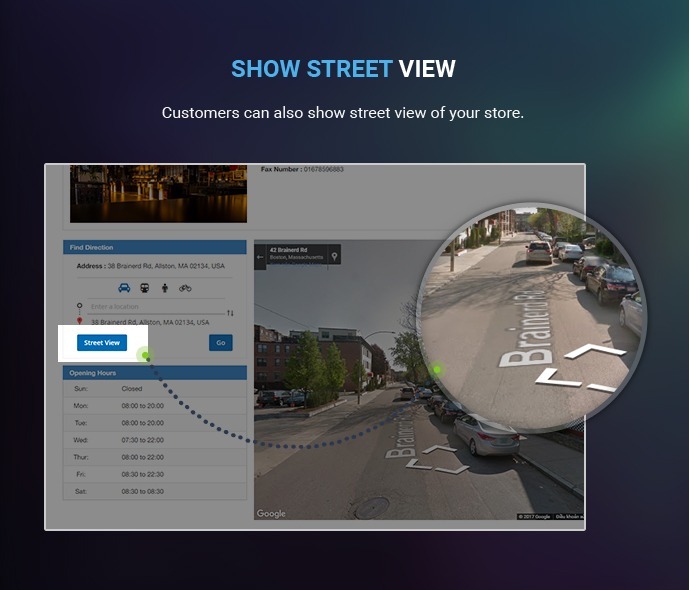 Show Street View: Customers can also show street view of your store. Schedule Information: Admin can set stores open times & days off flexible for each store location. And this schedule will be displayed in detail page of each store location. 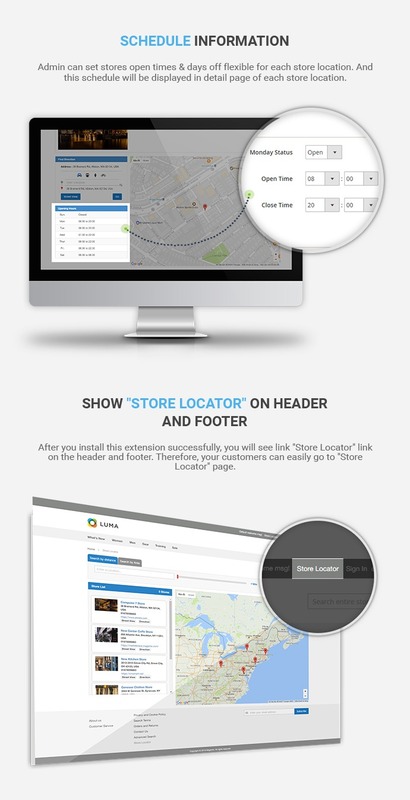 Show "Store Locator" on header and footer: After you install this extension successfully, you will see link "Store Locator" link on the header and footer. Therefore, your customers can easily go to "Store Locator" page. Setting for map: Admin has the ability to set default zoom value of initial map, default latitude/longitude, radius unit in miles or kilometers right in the back-end. 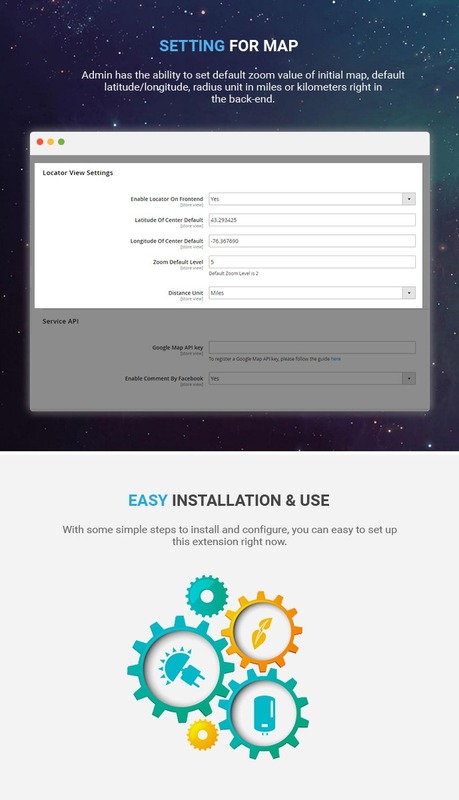 Easy installation & use: With some simple steps to install and configure, you can easy to set up this extension right now. Compatible with any theme: It is easy to integrate with other Magento 2 themes, which makes your website more professional and attractive. Thanks for the support, 10/10 for the product and service. very good support, appreciate the fast response! Quickly help us our customer to find the nearest store whenever they purchase the product. It gives the customer satisfaction and safety. 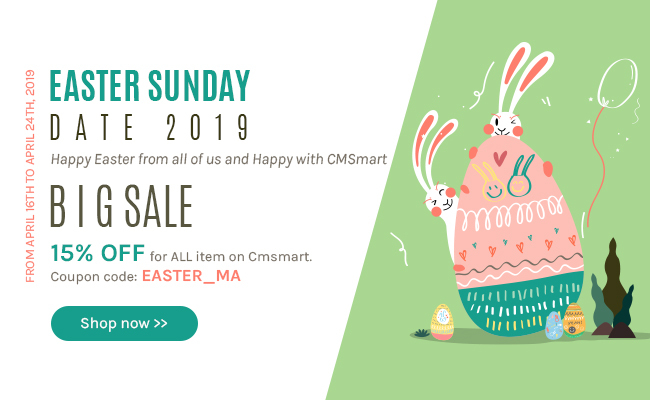 Thanks for CMSmart team, specially Victor for helping us to finish the site. Customers never get lost when coming to my store! It means so much to my sale revenue! Awesome! Is this Store Locator extension for Magento 2 responsive? Yes, it is. You can view in other devices as desktop, laptop and mobile. Does this extension support multi languages and multiple stores? Yes, you can setup any language and multiple store for Store Locator extension for Magento 2. Where can I change the Distance Unit? => Please go to the admin and follow the path: store locator/ setting/ distance unit. How can I add a new address? Go to the back-end and then click to Store locator/ manage store locator/ add new locator. Where can I Enable Locator on Frontend? Just go to the back-end and then follow the path: store locator/ setting/ Locator View Settings. How can I enable or disable the Enable comment on the Facebook? How many stores can I add in the store list? It is unlimited; this depends on the number of store which you get. Does Store Locator extension for Magento 2 suggest Google map? Yes, it suggests address for Google map. How many ways can customers search the address? You can search in 2 ways: Distance and Area. All of us understand that Magento 2 is one of the best platforms to successfully run an online store, let alone any type of products. Moreover, Magento 2 marketplace always offers us ideal modules and theme packages helping us serve our customers in the best way. While the e-commerce is developing as our technology booming, how to keep our customers stay at our site longer and longer is not easy. Among critical factors, store locator is much highly considered. It is more important when you are a shop owner whose a powerful website and a huge chain of offline stores. 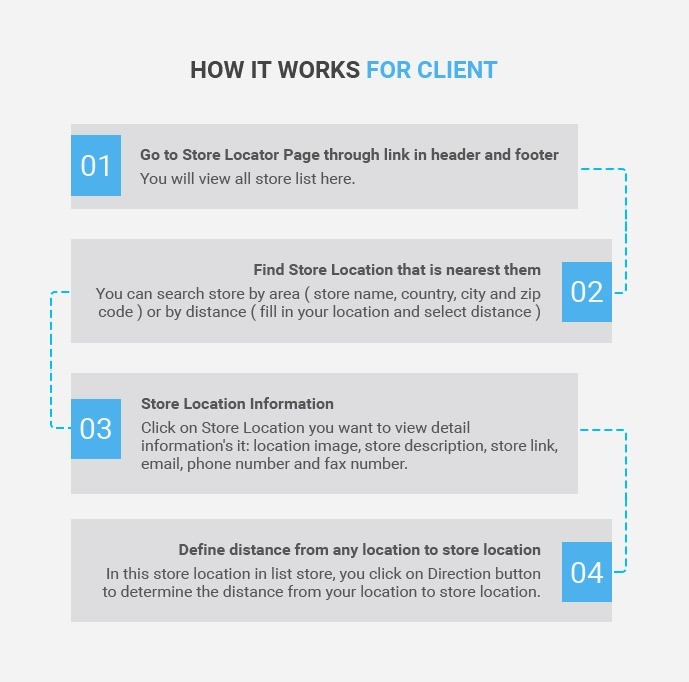 Thus, it can be said that Magento 2 Store Locator feature should be added to your Web-store. The issue is taken out that You are an online shop owner and have many stories which are located in different geographical locations. In order to reach the ultimate goal of increasing your store network as well as revenue-boosting, you need to find the best way to display and show customer how to get their near places to do shopping after completing order through the site. By guiding clients directly to your products, it helps you increase significantly sales: With customers, information of your store is very important when they come to store. Thus, if you can provide enough information and show them the best convenience, they will be very happy and want to do shopping on your store. It will be very effective if your products are displayed and sold in offline store. Store Locator helps you save much time and money when taking over the role normally fulfilled by you and your employees taking endless phone calls to direct clients to their nearest point of sales. This is also a good way to serve customers 24h/day and 7d/week. Store finder offers an elegant solution to protect your valuable distribution network by hiding the bulk of the list away on a secure server and only outputting tiny fragments at a time. Many of our clients have benefited greatly by taking their retail outlet information and put it all in one easy to manage place. 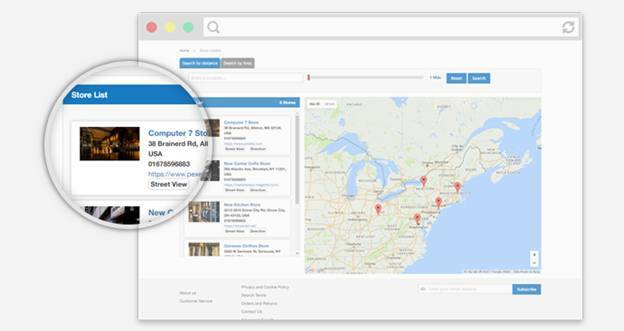 Store locator will centralize and simplify your outlet network and eliminate duplication of data. 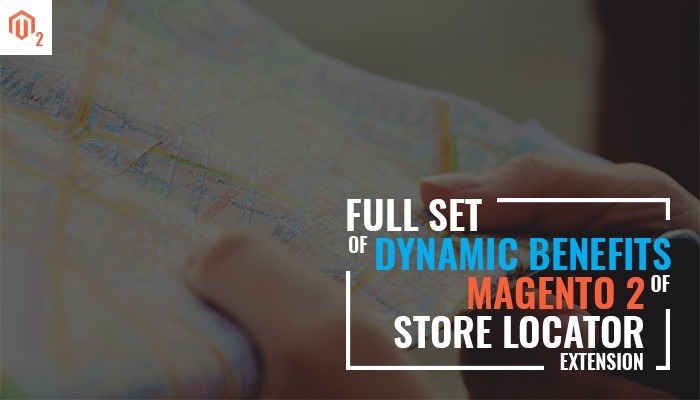 With Magento 2 Store Locator module, you will display full list stories right on the left tab, thus, your customer can view store locations on the map, full of necessary information. Moreover, the information of store location is added into each Product page, allowing shoppers to see store name, store image, store link, address, number phone, email, fax number and schedule of a store. This will be very helpful information for them to consider where to go when visiting your offline store. As you may know Google Map is one of the most powerful tools for anyone to find out their location. Customers just need to enter a few characters in the Address field and all relevant suggestions will be auto-drop as a list of choosing. Also, customers can get the direction to any store from their position by entering their store location and mode of traveling like driving, walking, bicycling or others. 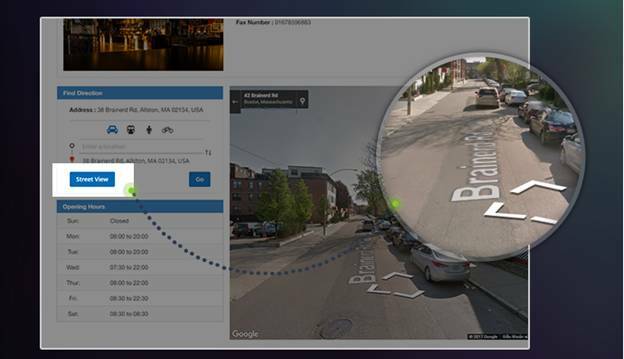 The map image even shows details of the street of your store, giving a clear guiding to customers, and they find easy to follow. Besides, Store Locator plug-in offers your audiences some methods to find a store location. Customers can search stores by are like country, state, city or zip-code and distance (by filling a location and select distance). The search result will display a list as the highlight on Google map. The extension is adjustable with any types of devices because it is completely responsive. More importantly, the Facebook comment box is available for customers to add review about quality for each store location. You just take some minutes to complete the installation and configuration of the module. Moreover, the module is compatible with any theme. 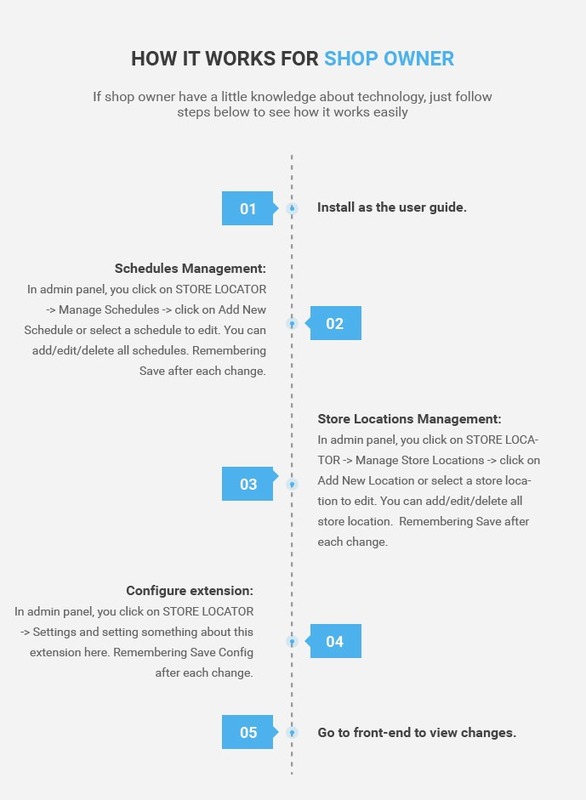 Any settings can be processed in the back-end, making you comfortable when control and create new store location. At the same time, admin is able to show store locator link on header or footer, letting customers easily go to Store Locator Page. The time of Open – Close duration of a store is also very important and admin can set stores open times and days off flexible for each location. 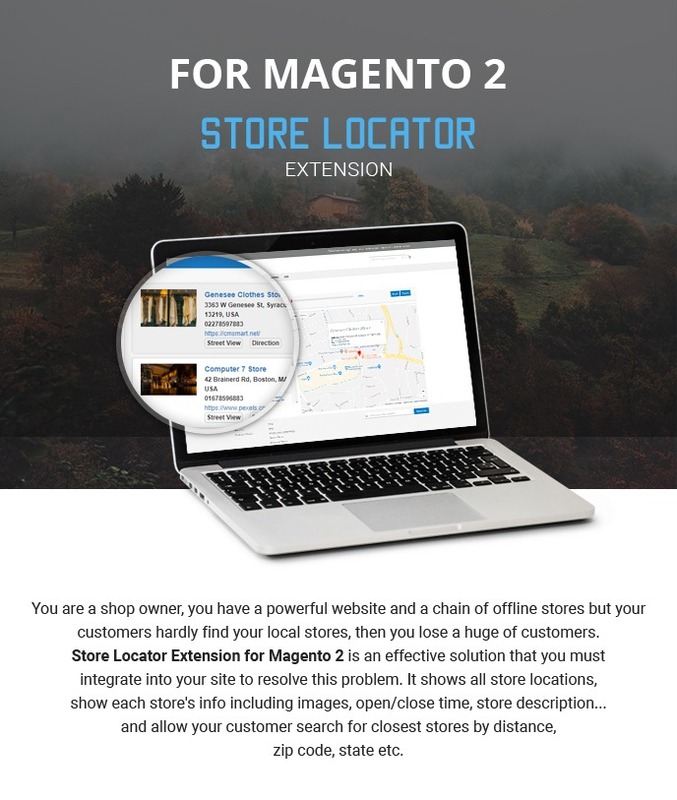 A simple function but very necessary, Magento 2 Store Locator understands how to comfy your customers and gives the best guidance of the way to your locations. You just have it install within some minutes and enjoy smart features of it. 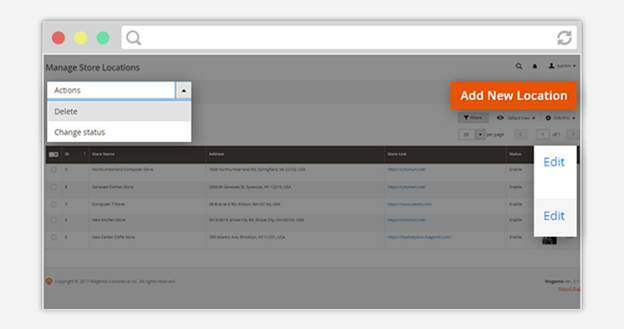 First, take a view of the Demo of this Magento 2 Store Locator extension. + Fix bug error 404 page when clicking on store name.